There was acrylic paints, xacto knife, cardboard and blankets everywhere today. Despite today's wild weather leaving us mostly housebound, we managed quite a lot. The house is a shambles and nothing can be done about it mid kitchen reno. So we went with the flow and had some fun. Clearing surfaces as we went. There was piano, a puppet show with tigers fighting over castles and a special delivery. And while I admired the knobs of the delivered shiny new machine (oh how lovely!) the children built a house with the massive box. The house, for some reason, is actually full of cardboard boxes. So inspired by Joel, we made paper clip puppets. Beans bubbled in the oven (whose days are numbered) and there was plenty of tea and toast. I love those days when we can just hang out at home. Seems crazy, but they are all so rare and all so special. my brother and i loved making houses, and boats when it fell apart, out of boxes. ooh, a lovely new cooker. always a good day. Hanging out at home rocks! It is amazing what can be created and dreamed up with cardboard, such a simple thing! It looks like your day was pretty magical! days at home are absolute favorites! Like you said, so rare! You look like you had a lovely time. the weather is incredible isn't it but just perfect for staying inside and starting/finishing different projects. Cooking in the warm kitchen seems to be the best bet today (Thursday), just hoping no more trees come down and take out the power lines! M has to go up to Hobart over the mountain today with the trailer to collect the ride on mower! He's determined to do it but I won't be happy until he's back. 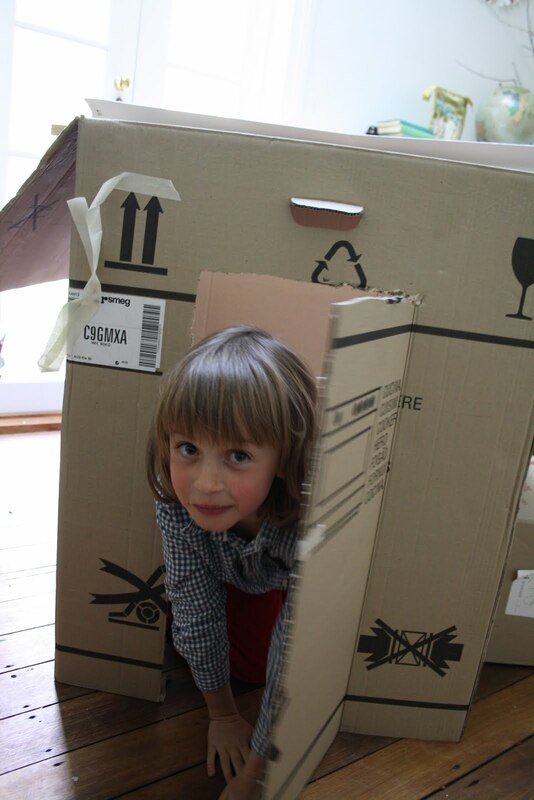 Cardboard boxes make the best toys! I have oven envy I admit! Looks fab, hope you can take it for a test drive soon. I agree with you. My home days with the smalls are my absolute favourite and my best. I wish I had more of them.